Benfica may be taken to court after astonishingly accusing other leading European clubs of corruption. 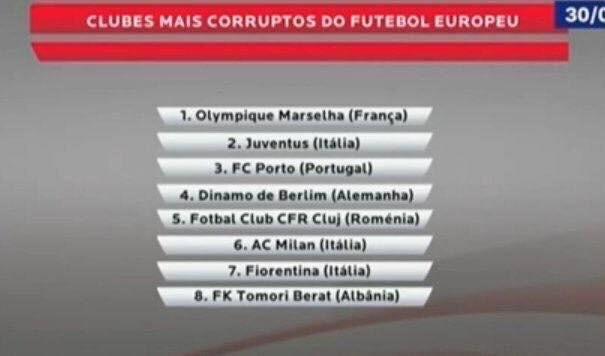 The Portuguese giants used their own television channel to make accusations against eight other clubs - whom they allege to be corrupt - including rivals Porto, Marseille and AC Milan. Porto have now taken steps to repair their reputation, announcing that are seeking legal advice against Benfica. "Before this accusation, Porto have communicated to the clubs involved that the list is false. On the other hand, we will make a decision to fix the good name of the club and for the damage caused," said an official statement. Benfica also list such clubs as Juventus and Fiorentina, and it remains to be seen if they too will launch legal proceedings.